What's your dog up to when you are away? WonderWoof can tell you. The bowtie-shaped device attaches to your dog's collar where it monitors the dog's daily activity. Is he sleeping? Chewing a bone? Staring out the window looking for you? The device calculates the amount of the dog's exercise and, based on his breed and size, and let's you know if he needs a puppy play date. The WonderWoof, pictured here with founder Betsy Fore, sells for about $95. 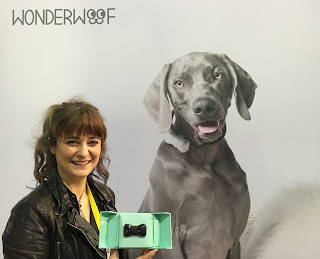 There's more information on the WonderWoof website. The weimaraner in the background is a photo, not a monster dog.